Susan Kristiniak of Northwest Medical Center-Springdale welcomes students to the nursing profession. Graduating senior Nicole Capdevila offers some thoughts from her experience. A nursing student is helped on with her coat by a faculty member. Lori Murray, right, assistant director for undergraduate studies, congratulates a student. Students wait in line for nursing instructor Hope Ballentine to read their names. A student looks up at the crowd while putting on his coat. A group poses for a picture on stage after the ceremony. Students recite the nursing student oath. Friends and family whooped, applauded and took pictures as nursing students crossed the stage Sept. 17, but they were celebrating a beginning, not a graduation. The University of Arkansas held its eighth white coat ceremony, a tradition started when the Eleanor Mann School of Nursing received a grant from the Arnold P. Gold Foundation. The Gold Foundation initiated the white coat ceremony in 1993 at Columbia University. The U of A is one of a select group of nursing schools in the United States that receive funding for pins that the students place on the lapels of their coats. Northwest Health also supports the white coat ceremony at the U of A. Lisa Franks, a nursing faculty member, organizes the biannual event. "This is a rite of passage," said Susan Patton, director of the nursing school. "Beginning today, instead of learning only in lecture halls and labs, you will transition to the clinical setting where the patient will be your ultimate teacher. The Gold Foundation calls this white coat the cloak of compassion." Susan Kristiniak, assistant chief nursing office for Northwest Medical Center-Springdale, also welcomed the students into the nursing profession. She told them they would witness what seems like miracles and unexplainable tragedies. She illustrated how nurses impact people's lives with a story of her proudest moment, helping to establish a "no one dies alone" at a community hospital where she previously worked. She also described how nurses have made contributions to improve efficiency and safety by inventing such items as disposable baby bottles, colostomy bags and crash carts used in the case of cardiac arrest. Nicole Capdevila, a senior who will plans to graduate from the nursing school in December, also spoke on stage. She advised the students not be afraid to be bold or to volunteer or to make mistakes. And, to "study, study, study" but also have fun. 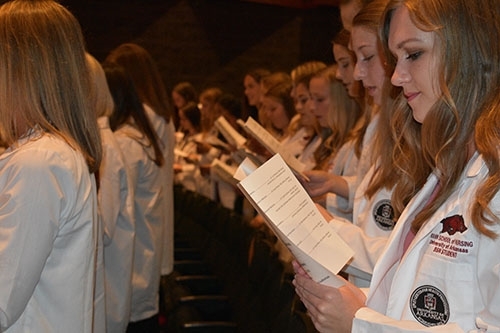 More than 100 first-semester students received their white coats, which nursing faculty members helped them put on as they crossed the stage one by one at the Fayetteville High School Performing Arts Center. They recited an oath and then joined their fellow students, friends and family members for more photographs.